The switchbacks (aka the Ws) viewed from above on the Pikes Peak Highway. 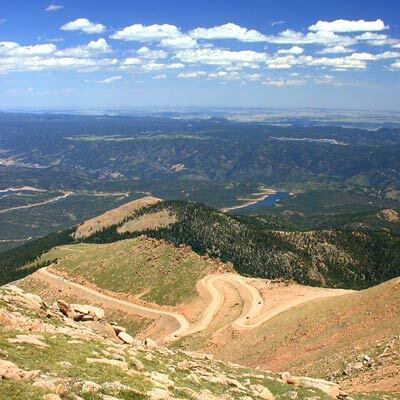 Every year, thrill seekers race up Pikes Peak in the second oldest auto race in the United States. If you want a challenge, try running a footrace with a finish line that’s almost three miles above sea level. Still want more challenge? Run it both up and down that same mountain. In 1922, five men climb to the summit of Pikes Peak on New Year’s Eve to set off fireworks. The AdAmAn Club continues the tradition to this day.